Dave Spencer – “Spanner” – was the sort of player who is the back-bone of a rugby club, an archetypal club man. Although playing eight seasons at Kingsholm, he only had three where he was a regular first choice. His career corresponded with a series of other outstanding back-row forwards, and he had to fight hard to achieve his spot in the team. Later he would go on to be a popular and inspiring captain for the United, and then pursue a successful career as a coach. David Spencer was born in Gloucester on 7 May 1958, and educated at Severnvale School. He played local rugby for Widden Old Boys, Cainscross and Stroud. “Spanner” made his first appearance for Gloucester on 1 January 1983 against London Scottish, playing at No.8. His first try came two days later against Moseley. Dave often played at blind-side flanker as well, and his five appearances that season were divided between the two positions. In the 1983-84 season Dave appeared in 37 games. He was now playing at open-side, in fine form, and displaced Mike Longstaff from his regular position. John Gadd and Mike Teague formed the rest of an outstanding back-row. In October “Spanner” scored two tries against Newbridge and no fewer than four against Clifton two games later. Nick Price bagged four tries in the same game. The following 1984-85 season saw the arrival of Ian Smith, who took over at No.7 to accompany Gadd and Teague. Dave had to be content with only five appearances, although he scored at least 12 tries for the United. In the next season Ian Smith was injured early on and Dave seemed to have recovered his open-side spot, playing in the first two rounds of the John Player Cup, when in November he injured his right knee playing against Cheltenham, and missed the rest of the season. This knee had been causing him problems for some time and would continue to do so. Worse was to follow for injury incurred on Gloucester’s summer tour to Florida in 1986, meant he missed the whole of the club’s 1986-87 season. “Spanner” explains, “I slipped a disc in my back while we were on tour to America in Florida. We had run out of props through injury and some sunburn issues, and yours truly volunteered to stand in. Big mistake!”. Dave did in fact play in two games, late in that season, for Widden Old Boys in the semi-final and final of the Combination Cup, against Coney Hill and Matson. 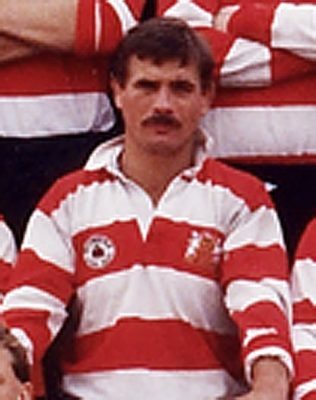 Fit again for the start of the 1987-88 season he appeared in Gloucester’s first ever Courage League game against Coventry, scored a try in the second against Bristol, and went on to make 21 appearances in all games. His form was so good that he made it into the South-West regional squad. In 1988, during pre-season training Dave injured knee ligaments again. The damage was such that surgery was required, which delayed his start as United captain. He would hold that post for three seasons with great success. He nurtured local talent, developing skills, so that the best of the players could go on to play for the first fifteen. The United’s record over those three seasons was impressive, especially in his final 1990-91 season, when of 34 games played 29 were won, and 1147 points were scored. The United won the Midlands and West League Merit Table for second fifteens. But in that final campaign Dave had a re-call to the first fifteen, playing in 21 games and scored 12 tries. In September he scored tries in three successive games against Clifton (2), Neath and Stroud. In addition, he scored tries against Nottingham and Moseley in the Courage League. Dave played his final game for the first fifteen on 20 April 1991 against Bath. He had played 113 games and scored 37 tries. For the United he scored at least 40 tries. The next season “Spanner” moved on to Lydney and captained them to victory in the County Cup, scoring two tries in the final, defeating Berry Hill 21-15. In the Pilkington Cup Lydney reached the third round losing narrowly at home to Sale 7-13. In the same season Dave captained Gloucestershire to promotion from Division 3 of the ADT County Championship. Dave was Gloucester United coach from 1992 to 1995, during which the team again won the Midlands and West Merit Table twice. He had two spells as Stroud Director of Rugby (1996-98 and 2012-15). In 1999 Spencer joined Paul Williams to coach Birmingham/Solihull. Promotion to National League 1 was achieved in the first season, but by 2002 the club went full-time professionally. Dave and Paul could not commit to the extra time involved and reluctantly resigned. In 2016 the pair were asked to help the club out as relegation from National League 3 Midlands threatened. Such was their success that the team finished in mid-table and won the Midlands Cup. Paul Williams and Dave coached the County squad in 2006 and 2007.